Throughout history, no other item of womenswear has been romanticised quite as much as the humble shoe. No longer an after-thought for brides, today, wedding shoes can be personalised and even custom designed, transforming them into a sentimental statement piece. Hannah Pronesti walks you through the options. In Great Britain between the 5th and 11th centuries, long before bouquets were thrown, Anglo-Saxon wedding guests were required to catch the bride’s shoe if they wanted to be next to wed. Even childhood fairy tales offer a rose-tinted interpretation of the shoe. After all, it was the glass slipper left behind at the ball that helped Prince Charming find Cinderella. Today, with a little creativity, the wedding shoes you wear can become an integral part of not only your wedding ensemble but your unique love story. 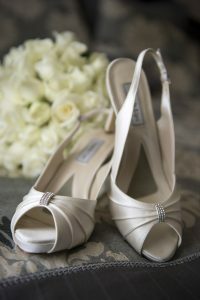 Plus, personalised shoes can serve as a nostalgic and sentimental reminder of your special day. Often wedding shoes are kept subtle so that they don’t upstage the dress. However, by designing or personalising them, your feet can be just as much a part of the overall look. Whether you opt for detailed or simple, quirky or classic, your shoes can really complement your bridal style and blend with your chosen flowers and colour scheme. Whether you chose to DIY or enlist a professional, there are many ways the modern bride can personalise her wedding shoes. There are a number of brands that offer the option to completely custom design your wedding shoes. Allowing choice over every aspect of the shoe, including the style, colour, heel height, fabric and adornments. Many women have a vision of the perfect wedding shoes in mind. Especially when it comes to a day as significant as their wedding. A problem can arise when a bride finds that the shoes she has been dreaming of don’t actually exist and she is then left dissatisfied with all other options. Finding the perfect shoe in a colour, height and style you like can be difficult. Finding the perfect shoe and not being able to track down your size is even worse. By custom designing your own shoes, you can rest assured that the shoe of your dreams will fit, no matter the size or shape of your feet. Good quality, stylish wedding shoes do come at a price. Which is why you want to make the most of the money you spend and avoid getting stuck with an unattractive pair that you will never wear again. By designing your own shoe, you can be sure that you’ll get something that is exactly your style. You don’t need to make sacrifices because you can choose every aspect of the shoe and create something that you will want to wear again and again. Custom design can also be beneficial when it comes to choosing your bridesmaids’ shoes. Depending on how many bridesmaids you have, it can be difficult to please them all. Everyone prefers a different style of shoe and is comfortable walking in a different size heel. By having your bridesmaids custom design their own shoes, you can still coordinate your choice of fabrics and colours, but in styles they will feel comfortable in all day. probably be happier spending their money on a shoe made especially for them, and that they will happily wear again. However, custom designed wedding shoes can also make a thoughtful gift for your bridesmaids. For the bride who likes to boogie, you can design two pairs of shoes that match your dress perfectly. Some brides might opt for a heeled shoe for the ceremony and photos. Then, they might change into a more comfortable flat shoe in the same fabric and colour to wear for the reception – and most importantly, on the dance floor. If you’ve already found your perfect shoe or you don’t have the budget to have them custom designed, fear not – there are other ways to personalise them! Decals that stick onto the soles of the shoes are a growing trend. You can choose from a range of decals or design your own. You might have you and your partner’s names and wedding date inscribed on the sole, or some pretty illustrations. Wedding shoe decals look great in wedding photos and add a personal touch. Even if they aren’t visible and only you and your partner know they are there, it can be a beautiful way to remember your wedding. Additionally, you can turn the shoes you wear on the day into a beloved keepsake. If you have purchased a simple pair of wedding shoes but you’d like to add something more to them, you are in for a real treat! Wedding shoe illustrators can create a beautiful piece of art on your shoes with ink or paint. Plain shoes work best and you can collaborate with the illustrator to come up with the perfect design. The illustration is a great way to make your shoes unique. For instance, it might feature a favourite romantic quote or a scene from your first date together. If you consider yourself a budding Leonardo Da Vinci, why not have a scribble yourself? If drawings aren’t your style, you can always decorate your shoes in other ways. There are all kinds of adornments available at art and craft shops. Everything from bows and brooches, to pearls, lace, buttons, flowers, rhinestones and jewels. However you choose to personalise your wedding shoes, make sure you stay true to your personal style, and choose something that you not only love the look of but that you feel comfortable in. That way, you’ll start your wedding on the right (and stylish) foot!